Ob es das schon für dieses Jahr war? The Tioga Road and Tioga Pass will be closing at 5pm today, Thursday October 19, 2017, due to the possibility of snow from an approaching weather front. The road will be evaluated Friday morning to determine if it will reopen or remain closed for the season. Currently no overnight parking is allowed along the Tioga Road or the Glacier Point Road. If the Tioga Road closes Highway 4 (Ebbets Pass) and Highway 108 (Sonora Pass) will most likely close as well. Please call 209-372-0200 (press 1 then 1) for the most up-to-date road conditions. Visitors to Yosemite National Park should be aware of a number of construction projects that may cause delays in their travels. Contractors continue work on Northside Drive between Sentinel Drive and the Yosemite Lodge crossing near Yosemite Falls. Currently they are installing curbs. Flaggers will control traffic, with one lane open at a time. Contractors also continue road work on Northside Drive from the Yosemite Lodge intersection to just past Camp 4. The Camp 4 parking area will remain closed while contractors set wheel stops. Campers will continue to have parking available across the street at the Yosemite Falls parking area. Northside Drive between the Yosemite Falls crossing and Camp 4 will remain limited to one westbound lane. Eastbound traffic will continue to travel through Yosemite Lodge. The contractors hope to complete this work by Thanksgiving if the weather remains favorable. Masons will begin work on the masonry headwalls on Northside Drive in the west end of Yosemite Valley and El Portal Road between Pohono Bridge and the Big Oak Flat intersection. Work will take place during the day, with one lane closed near each headwall. Around the South Entrance, there will be 30-minute delays with single lane traffic control from 6 a.m. to 8 p.m. Expect heavy truck traffic around the south entrance as crews continue grading and paving the roadways and parking lots. The 30-minute delays will continue through October. Between the Rostrum and the Wawona Tunnel, motorists can expect up to 15-minute delays from 8 p.m. to 6 a.m. as crews continue with culvert-shoulder-ditch repairs. In the El Portal area, crews are working during the day and throughout the nighttime hours, completing storm-slide repairs on the El Portal Road between the western park boundary (Yosemite View Lodge) and the Big Oak Flat Intersection. On the Big Oak Flat Road, crews are working from the long tunnel on Big Oak Flat /Highway 120, working westward. Expect short delays. Please drive slowly in the work zone, watching for workers, equipment and debris on the road. This project is expected to last up to 4 weeks, with operations being done Monday through Thursday from 7 a.m. to 4 p.m., and some Fridays. As of this date, Tioga Pass and Glacier Point Road remain open. The Mariposa Grove restoration project will restore the grove's dynamic ecology and increase its resilience. As a result of this project, the Mariposa Grove is currently closed and is expected to reopen in spring 2018. Zurzeit sind auch der Tioga Pass bzw. die Glacier Road geschlossen - sollen aber wieder öffnen. The Tioga and Glacier Point Roads in Yosemite National Park are closed for the season, due to hazardous driving conditions. Recent winter storm activity throughout Yosemite National Park has resulted in snow accumulation above 6,000 feet. Glacier Point and Tioga Roads close each fall, when snow and ice create hazardous driving conditions, and remain closed throughout the winter months until weather conditions permit reopening in the spring. Yosemite National Park is open year-round with snow removal on all other roads within the park. All roads within the park are subject to chain control or temporary closures due to hazardous driving conditions. All motorists are required to carry tire chains, even if their car is equipped with four-wheel drive, while driving in the park during the winter months. California’s Yosemite National Park in winter is magical, with skiing, sledding and skating in the shadow of the famed granite formation known as Half Dome. Every year in mid- February, the waters of Yosemite National Park’s Horsetail Falls glow as if they are on fire. It is phenomenon that occurs in a small window of the year and only at certain hours of the day. This year the viewing will begin Feb. 12 and end Feb. 26.. 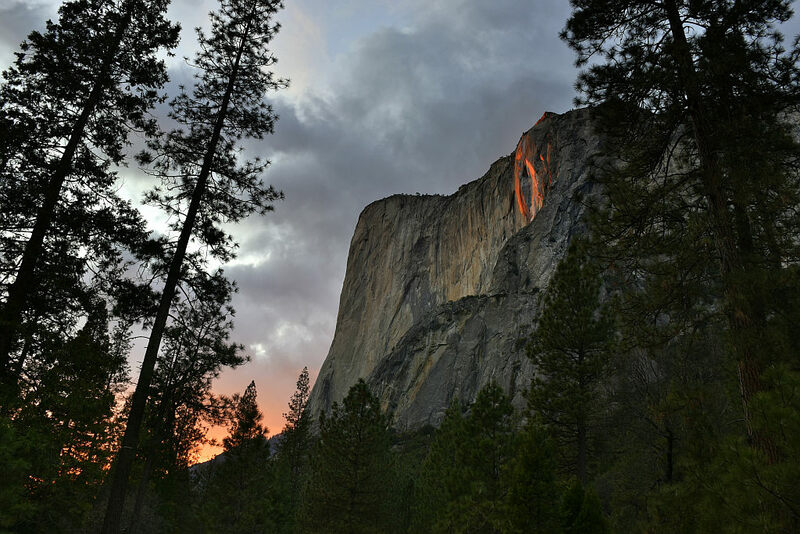 According to Yosemite, over the past several years, the popularity of viewing the Horsetail Fall phenomenon has grown significantly with thousands of visitors arriving to catch a glimpse. But due to its growth the traffic has become unmanageable and dangerous for motorists and pedestrians alike. This year, Yosemite is trying a new approach to manage the traffic. It will create an event zone inside Yosemite Valley, from the Yosemite Valley Lodge to El Capitan Crossover. Visitors will be able to enter the event zone and view Horsetail Fall by walking from El Capitan Meadow or the Yosemite Falls Parking Area, taking a naturalist-guided tour, or picking up a permit to park inside the event zone. With in the zone there will be event parking for 300 vehicles. 200 free parking reservations per day, will be available online and a printed copy should be brought to the Ansel Adams Gallery for a parking pass, beginning on Saturday Feb. 3 at 9 a.m.. 50 first come, first served permits will be available each day from 9 a.m. to 3 p.m. at the Gallery in Yosemite Village. Visitors interested in walking to the event site are encouraged to park in the Yosemite Falls Day Parking Area, park at El Capitan Meadow, or ride the free park shuttle to Shuttle Stop #7 and walk into the event site approximately 1.2 miles one way. Yosemite Hospitality, Inc., the park’s primary concessionaire, will be offering naturalist-guided tours each day for a fee to the Horsetail Fall Event. To reduce traffic congestion in the event zone and to ensure easy visitor access to Yosemite Valley, the park will convert Southside Drive to two-way traffic from El Capitan Crossover to Sentinel Bridge. No roadside parking will be permitted while two-way traffic is in place for the safety of both pedestrians and motorists. On Northside Drive, the left-hand traffic lane in the event zone will remain open as an exit route for YARTS buses, commercial buses, and other vehicles exceeding 25’ in length. Visitors who plan to get to Yosemite Valley using the Yosemite Area Regional Transit System (YARTS) should make sure that they do not miss the last bus of the day. The closest YARTS stop to the event is located at Yosemite Valley Lodge. YARTS buses will not be picking up visitors in the event zone. Can anything be done about the gridlock in Yosemite? The sheer granite walls, the waterfalls, the breathtaking vistas, the scent of cedar, air that sparkles on cold days: Yosemite National Park is a natural wonder. How could anyone associate it with misery? Easily, alas. Just try to park there. Even now, in the supposed off-season, tourists hoping to get Yosemite all to themselves find the visitor lots full, frequently. Yes, Yosemite always has had traffic, but the last couple of years have seen extreme congestion; the park had almost as many visitors in 2016 as there are people in Colorado. Discomfort has risen in direct proportion to the demand on parking space. Last summer, the gridlock was so far gone that visitors routinely were turned back after waiting for hours, inching their way toward the park in miles-long, diesel-choked lines of cars, trucks and buses. Some made it in only to be diverted out after paying the $30 per vehicle entrance fee. That’s the situation that Yosemite’s new head, Mike Reynolds, will inherit when he takes over later this month from acting superintendent Chip Jenkins, who has been forthright about the public’s dissatisfaction. Addressing that misery has been a challenge. Much of the national park system, in fact, has struggled in recent years to accommodate congestion and crowds. Low airfares and the surging economy have boosted tourism worldwide, generating record interest in this country’s destination attractions. The Grand Canyon National Park last summer had to dispatch extra staff to help visitors find parking, and a community with a shuttle bus to the park had to extend the service. Zion National Park in Utah had shuttle buses running every three to five minutes while park staff worried about erosion from all the foot traffic. Of the 50 busiest days in park history, 38 were in 2017. By noon on most summer weekends, cars were backed up a mile from the gates. Then it was a slow crawl into the Valley. There is little reason to expect Yosemite’s misery index to improve as the weather warms this year. The crowds keep coming, and the Trump administration has proposed cutting the National Park Service budget 13 percent. The park has added 450 parking spots in two years, with a few dozen more this year at Camp 4 and Curry Village for about 6,500 total. Some can be reserved. It’s still not nearly enough. More than 8,000 cars a day jammed the valley last summer on busy days. Increasing park entry fees to $70 per car, as Interior Secretary Ryan Zinke has suggested, might tamp down demand, but pricing Americans out of their own parks can’t be the answer. Rep. Tom McClintock, R-Elk Grove, whose district includes Yosemite, wants to build more parking lots, but creating parking is so politically sensitive that many won’t even discuss it. What part of the natural wonder could be bulldozed to make way for a multi-story garage? Here’s another idea, though: Maximize parking outside the park, and create staging areas for tourists, as they are considering in Tahoe. There are dozens of motels along every road into Yosemite. Why couldn’t they be encouraged to offer shuttle services? In summer months, school parking lots sit empty. Couldn’t they be made useful? Meanwhile, the Yosemite Gateway Partnership, a four-county public/private consortium, promotes visits in non-peak months and combining trips with activities outside the park – rafting, spelunking, mountain biking, fishing. Other parks are trying other solutions. Zion has expanded its summertime ban on cars year-round. Arches National Park, also in Utah, will try a reservation system this summer. If the Yosemite experience remains miserable, there are real consequences. Park tourism is a linchpin of the regional economy; thousands of jobs depend on it. Mariposa County gets $14 million of its $55 million annual budget from its tourist-dependent Transit Occupancy Tax. The Yosemite experience shouldn’t be about getting stuck in miserable traffic jams or mired in endless searches for a parking. It should be about mountains and waterfalls and natural wonder. There must be a way to get back to that. Adventurers hoping to see Yosemite National Park's annual "firefall" will need reservations. habe SA passend am Rechner gesessen. Die Vergabe war 10min vor der offiziellen Zeit geöffnet. Da gab es zu meinen Daten teilweise nur noch 30 Tickets. Mittlerweile sind alle weg. HELLO AGAIN, MARVELOUS MARIPOSA GROVE: What exactly were you doing near the start of July in 2015? You might have been observing Independence Day, at home or on the road, as many people around California were doing. In addition to this early-July tradition, though, you might have also called upon a certain segment of Yosemite National Park, with the knowledge that the wondrous area would soon close for a number of years, all to provide the area with several needed improvements. If this applies to you, you were likely among the big trees at Mariposa Grove of Giant Sequoias. FRIDAY, JUNE 15, 2018, at 9 o'clock in the morning. There's a sizable new parking area near the South Entrance — some 300 vehicles can park — and a shuttle can transport you to the Lower Grove (it is a free ride from the Welcome Plaza). You'll want to keep an eye on the Yosemite social media feeds as June draws near, for more information about the beloved clutch of ancient trees, trees that many people will be eager to see again after nearly three years away. Of course, the trees weren't away — they kept on growing and thriving, even in the absence of visitors — but sequoia fans were. Now "the largest sequoia grove in Yosemite" will throw open the proverbial doors in the middle of June, to the joy of many. Amid a year marked by low rainfall, there was some concern that Yosemite's famous "firefall" would be running dry in February. The natural marvel usually occurs during a two-week stretch in the early part of the month on the east side of El Capitan. 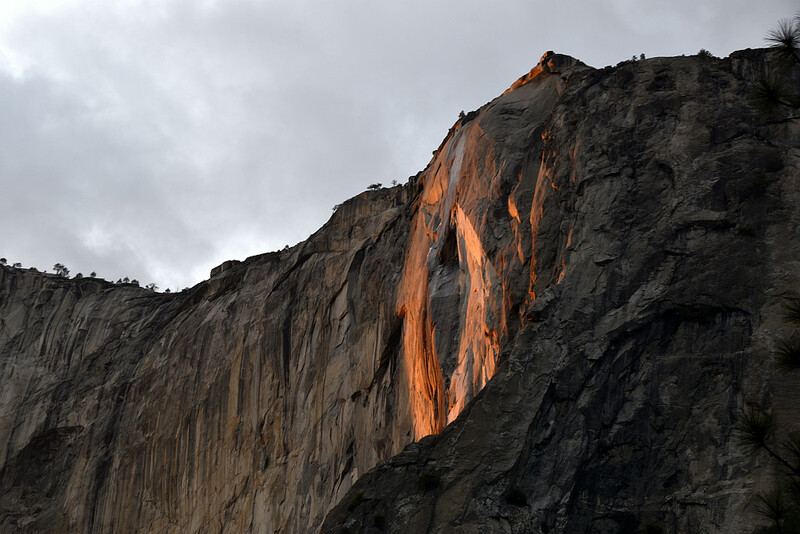 When Horsetail Fall is flowing and the weather conditions are just right, the setting sun illuminates the ribbon of water and granite face with a fiery glow. A week ago, the falls was as dry as a bone. But with the light snow flurries over the weekend, a trickle is now dripping down the face of Horsetail, treating onlookers to one of California's favorite natural splendors. "There was just a little water at the top," says Pat Moynihan of San Francisco who photographed the falls among a crowd of hundreds on Saturday. "I think a lot of the firefall is the combination of the water and the light. The light actually was filling in the rest of the fall and creating the illusion of there being a fall." Schade dass es nicht ganz geklappt hat! Bist ja noch jung, klappt schon irgendwann! Trotzdem schöne Bilder. Mit Wasser wäre es toller gewesen; aber die Bilder sind auch ohne gut geworden! Hiking to the top of Yosemite National Park's Half Dome is one of the world's most spectacular hikes. It starts on a trail that winds past glorious waterfalls and ends with a strenuous cable-assisted climb up the side of the granite formation to reach the expansive vistas at the top. But only 300 hikers each day get the honor of making the trek, and right now, you have the opportunity to apply for a permit. The National Park Service is currently accepting applications for their preseason lottery. Now through March 31, climbers can submit their name online for a chance to be granted one of the 300 daily permits. The cost to apply for the lottery is $10 and if you win, the permit costs an additional $10. The permit winners will be announced in mid-April. Rangers have created some graphs that show how many people they expect will want to hike the trail on each day. The less popular the day, the more likely you are to be granted a permit. The National Park Service said it plans to install the cables on the side of Half Dome on May 25 and keep them up through Oct. 9. Those dates could change if weather creates dangerous conditions. If you don't receive a permit, you're not entirely out of luck. The National Parks Service offers a limited number of permits through daily lotteries that begin when the cables go up. The National Park Service has a webpage with more information on the lottery.